Kurt Schwitters’s impact on British art has been profound, resonating with artists from the Pop generation of Richard Hamilton and Eduardo Paolozzi to artists working now. Schwitters spent the last eight years of his life in Britain, but he had been a significant figure in the early twentieth-century European avant-garde before coming to Britain as a refugee. Choosing to leave Germany in 1937 after his work was condemned as ‘degenerate’ by the Nazi government, Schwitters settled in Norway for three years. He escaped to Britain in June 1940 after the Nazi occupation of Norway. Schwitters was one of many German exiles, including a significant number of artists, to be interned on the Isle of Man during the Second World War. 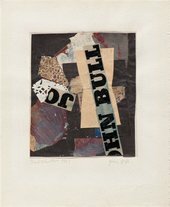 On release in 1941 he became involved with the London art scene and his work began to engage with British society and culture, shaped by the use of new source materials for his collages and poems. In 1945 Schwitters relocated to the Lake District and, inspired by the landscape, his work focused on the natural world. Here he created his last great sculpture and installation, the Merz Barn. Schwitters died in Kendal in 1948, the day after he was notified of his successful application for British citizenship.